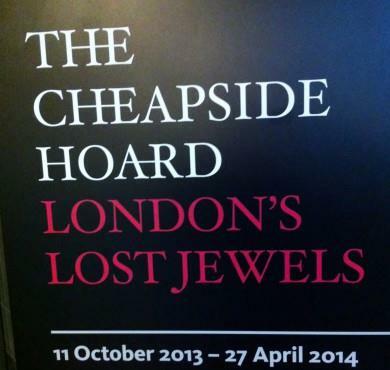 Between 1640 and 1666 when the Great Fire decimated London a cache of jewels was buried in a cellar in Cheapside. Discovered in 1912 by workmen this hoard rates as one of the most important discoveries as it gives a very detailed look at the jewels and jewellery from the Elizabethan and Jacobean period. 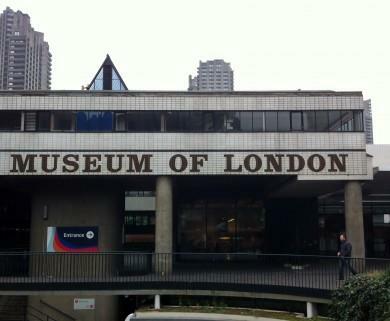 For the first time since its discovery a century ago the entire hoard is on view at a special exhibition in the Museum Of London. Entry to the exhibition is through strict security and when you enter it is easy to see why. The value of the hoard today is beyond measure not only in terms of money but also knowledge. The period when the hoard was thought to have been buried was particularly tumultuous. The Great Plague which killed about 100 000 people, the British Civil Wars, the rise of Oliver Cromwell and the Roundheads, the execution of Charles I in 1649, and finally the Great Fire of London in 1666 made for very dangerous life. No wonder the owner of the hoard, now thought to be a working goldsmith hid his stock-in-trade by burying it in the cellar. 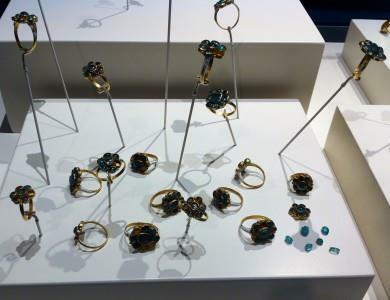 The exhibition is smartly laid out in display cases that allow you to stand closely while you examine the detail of the various treasures ranging from rings and brooches through to exquisite necklaces. Thoughtfully there are magnifying glasses provided that you can use, to enhance this experience. What also makes this exhibition really work are the period oil paintings showing a lot of the type of jewellery from the hoard being worn. As can be seen from the rings displayed here, the detailing in goldsmithing is surpassed only by the stone cutting and polishing. Cheapside since the thirteen hundreds was known to house a jewellery industry that encompassed goldsmiths, silversmiths, stone cutters and polishers as well as the Goldsmiths hall where testing and hallmarking was done. The gems found in the pieces are from as far afield as Brazil, Colombia, Sri Lanka, India and the Red Sea. The hoard laid out like this is truly breathtaking and one can only imagine how dramatic it must have been when first discovered glinting in the soil beneath the cellar floor. 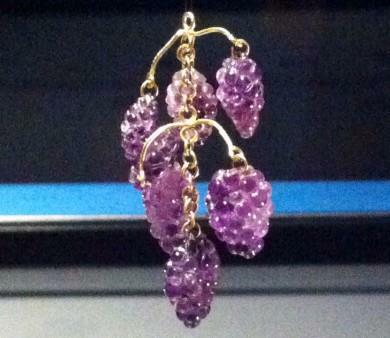 While studying a case filled with very delicate grape shaped pendants made from emeralds and amethyst in the form of ripening grapes on the vine, I overheard three young ladies discussing these. They had noticed the detailing of the wire and enamel work representing the leaves and tendrils and were highly impressed with this. In our modern world the fact that they impress leads one to speculate how the original recipient must have felt when being presented this tour de force by her suitor 350 odd years ago.